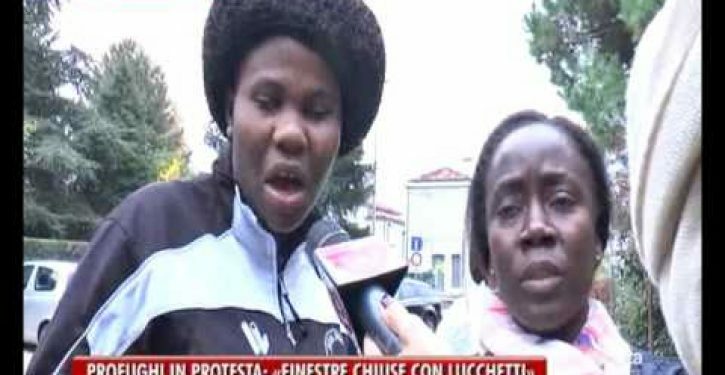 African migrants who took the streets in protest and blocked traffic in Venice this week have been demanding designer clothes, the president of the Cooperativa Sociale Onlus has revealed. Lorenzo Chinalleto, whose cooperative hosts migrants at the Hotel Byron in the Venice province, said migrants respond with displeasure when receiving clothes from Catholic charity Caritas and other charitable bodies, because the goods are unbranded. He explained: “Unfortunately they come to Italy with the asylum reception systems of northern Europe as a model. When they arrived we gave them clothes, standard clothes. “But they want brand-name clothes like Armani and Boss, and they asked for Pirelli shoes. These are their models. When they came to us, they didn’t have clothes, but they all had smartphones,” the Italian added. Forty of the migrants hosted at the Hotel Byron took to the streets to express their dissatisfaction, blocking the traffic. In a video taken outside the hotel on Monday protesters can be seen shouting, in English, that they don’t want to eat pasta. The migrants originate mostly from Senegal, Nigeria, Somalia, Mali and Ghana, Il Gazzettino reported.